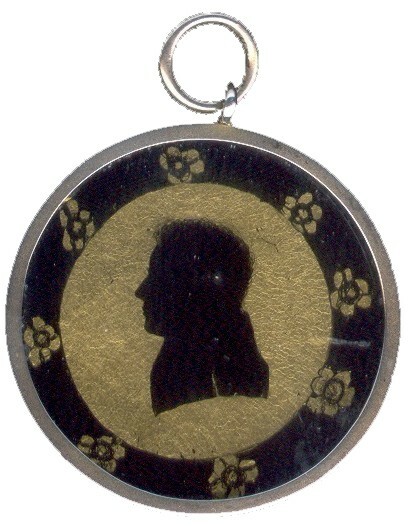 This jewellery piece holds an early 19th century silhouette of a gentleman. The detailing to the profile include strands of wavy hair, a bushy eyebrow and an eyelash. The profile is reverse painted on flat glass in black against a gold background within an attractive floral border. The silhouette is set in the original gilt metal pendant frame with a solid back. Internally the frame has been padded out with card bearing German text.